Happy last day of July! 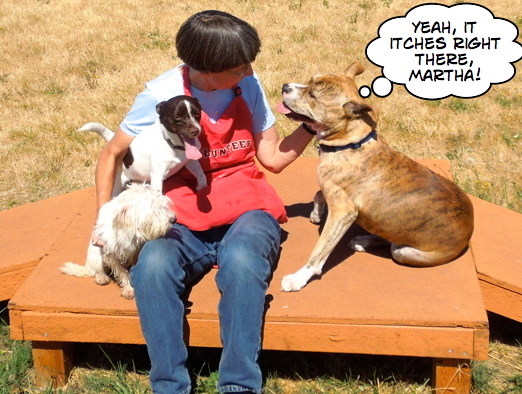 What better way to spend it than at Willamette Humane Society with the dogs? 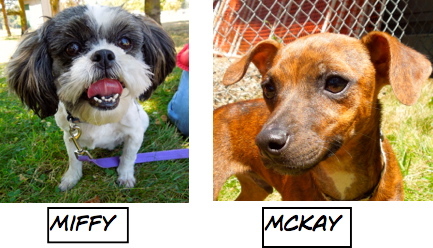 But before I tell you about the friends I visited today, here are last week’s happy adoptions of Blog Dogs! Play group was especially busy, due to some new S.T.A.R.T. 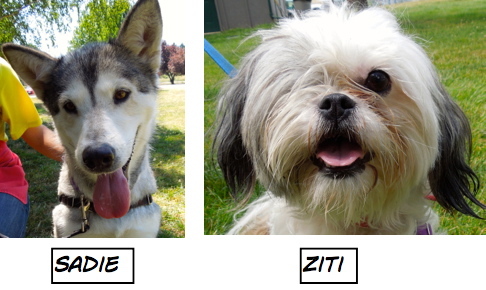 arrivals from California along with our “regulars.” Axel was the first dog out and the last dog back in. He had a great time! He decided to take Scooter, a six-month-old puppy, under his paw and was generous with advice. 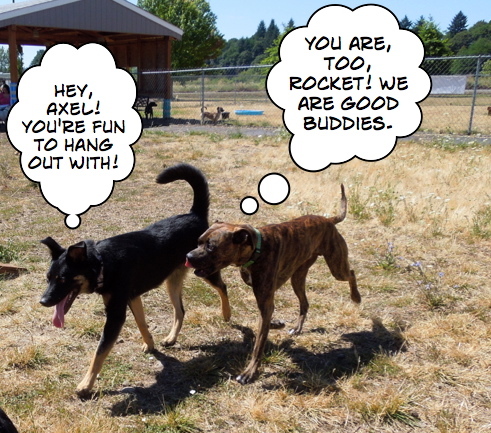 Axel and Rocket, a one-year-old German Shepherd mix, enjoyed some time together. 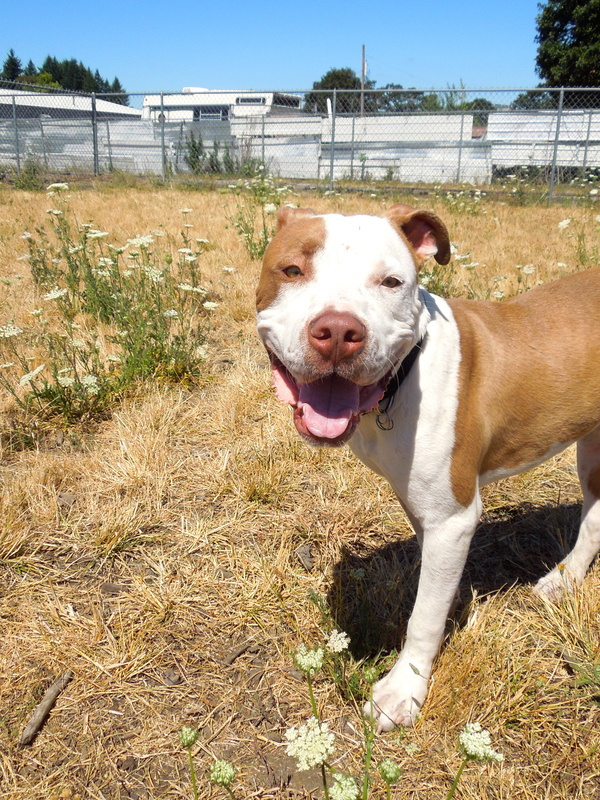 Mia is a one-year-old Pit Bull Terrier mix, a newbie who has won many fans already with her gentle ways. Volunteer Jeff became a Mia fan, too. And she got picked to be a Camp Dog for this week! 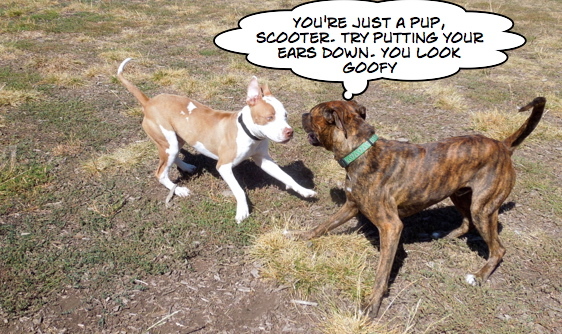 Scooter not only looked up to Axel, but also to Viking, a one-year-old Pit Bull/Great Dane mix. 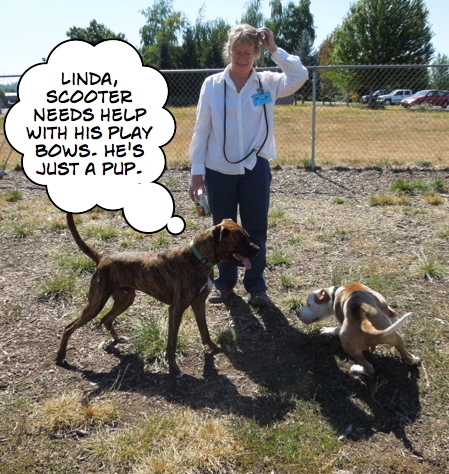 I couldn’t resist putting this picture in, as Scooter looked so happy to be in play group. Animals are rescued from high kill shelters in central and southern California and transported to northwestern rescue organizations, where they are re-homed. 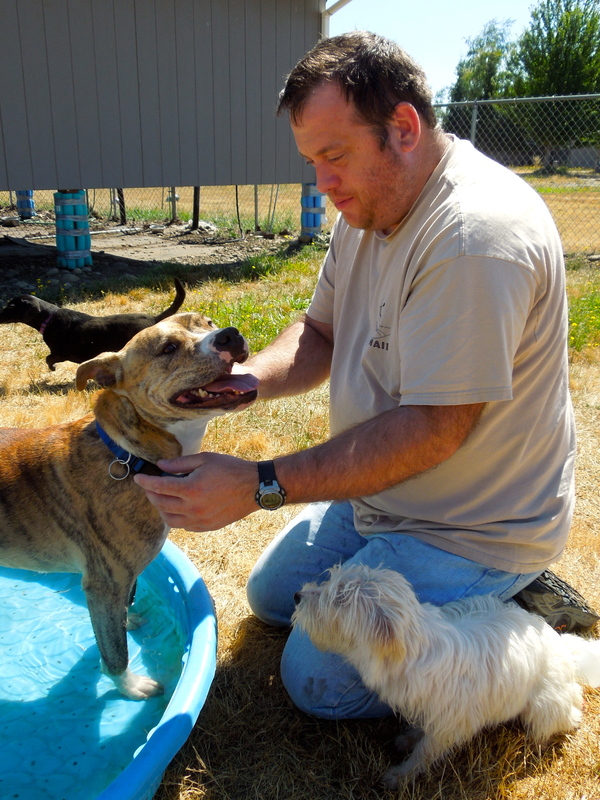 WHS is one of many shelters and rescues in the Northwest which has teamed with S.T.A.R.T. to save the lives of many wonderful dogs. 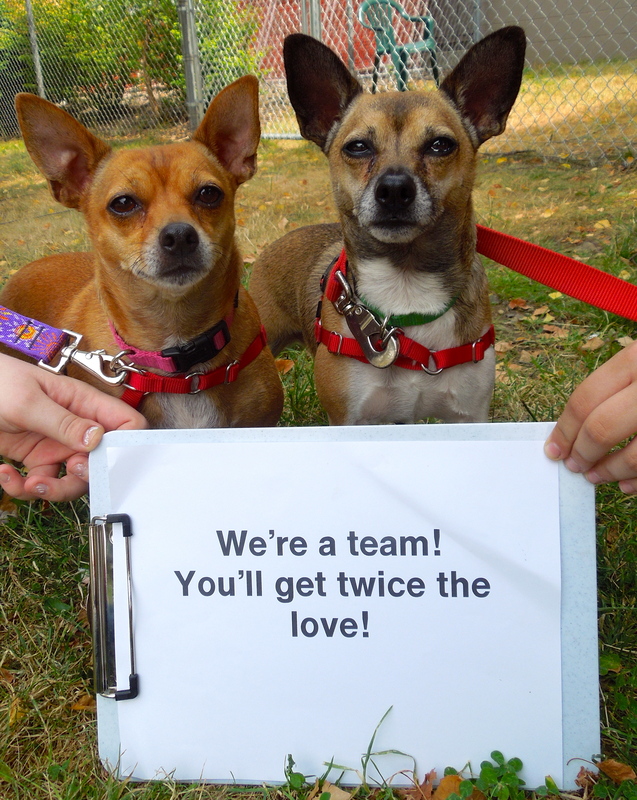 Last week we accepted seven arrivals, hoping that they will find happy forever homes in Oregon. Some dogs do not like my camera! 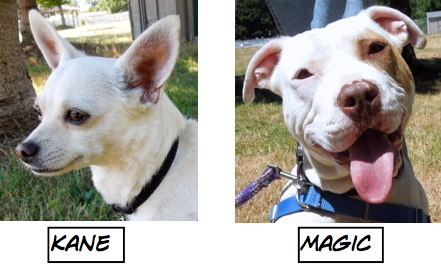 One of the new dogs I needed to photograph was Magic, a two-year-old Pit Bull Terrier mix S.T.A.R.T. dog. I liked him immediately, but as soon as I got out my camera, this was what I got. Each time I shifted to be in front of him, he would shift so his back was to me. I’m sure we were quite humorous to watch! Being patient finally won me this shot. Magic is a camp dog this week, too. He is a very good boy. I’ve moved here from California hoping to find an Oregon home. Sunday walker Luke spent time with another S.T.A.R.T. 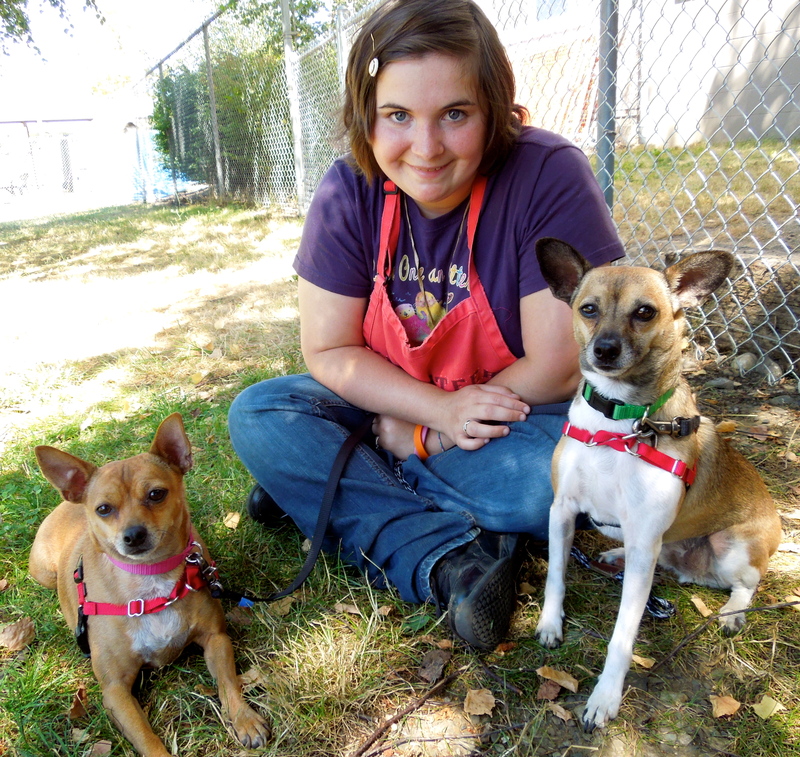 dog, Alphie, an eight-month-old Chihuahua mix who had a great time in play group romping with the little dogs. 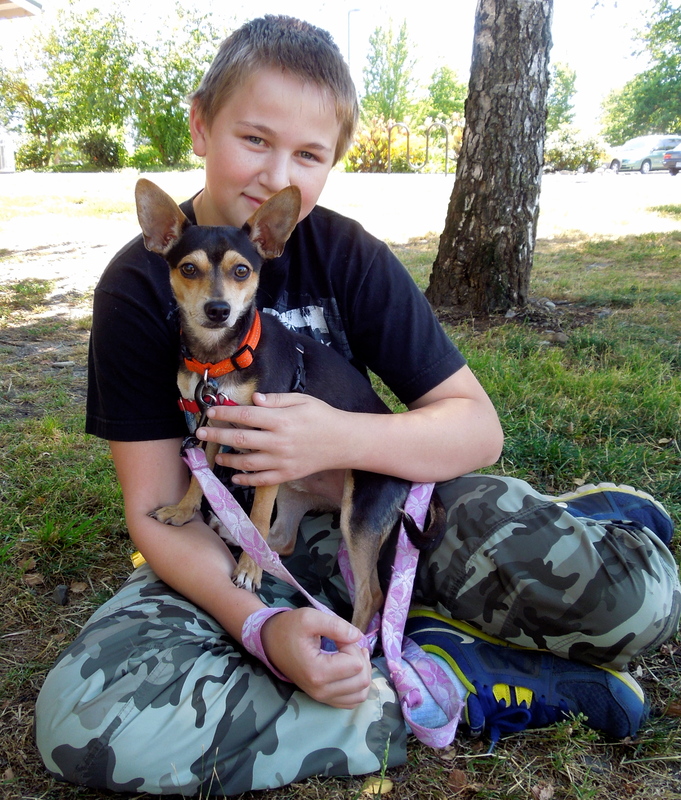 Alphie is a little shy, and is hoping for a calm home with older kids or adults. He loved my hot dog bits! 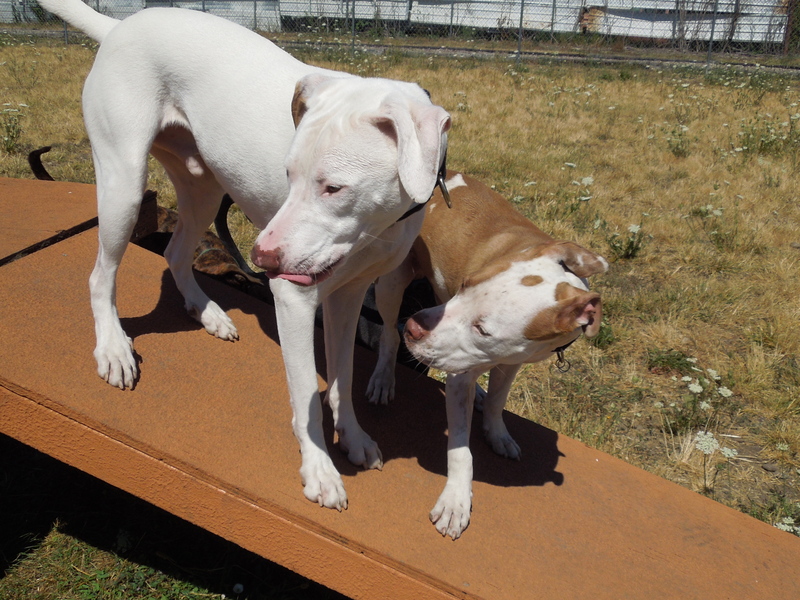 We’re a bonded pair and need to go home together. 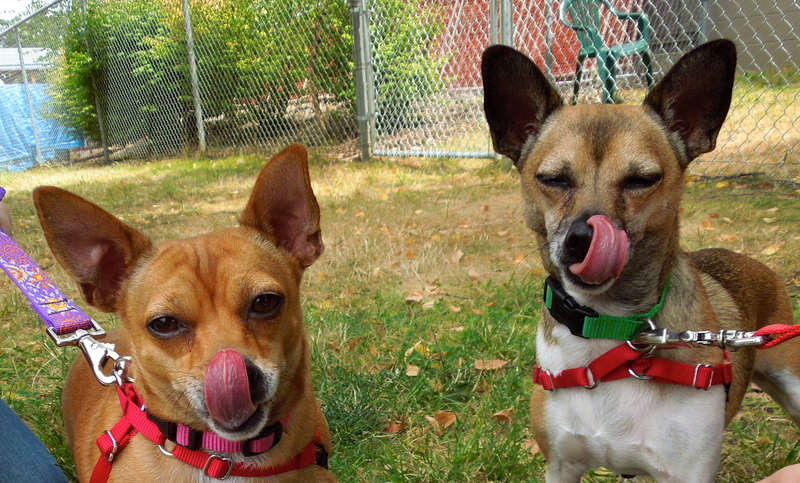 Meet Busy and Max, two six-year-old Chihuahua mixes who are best friends. 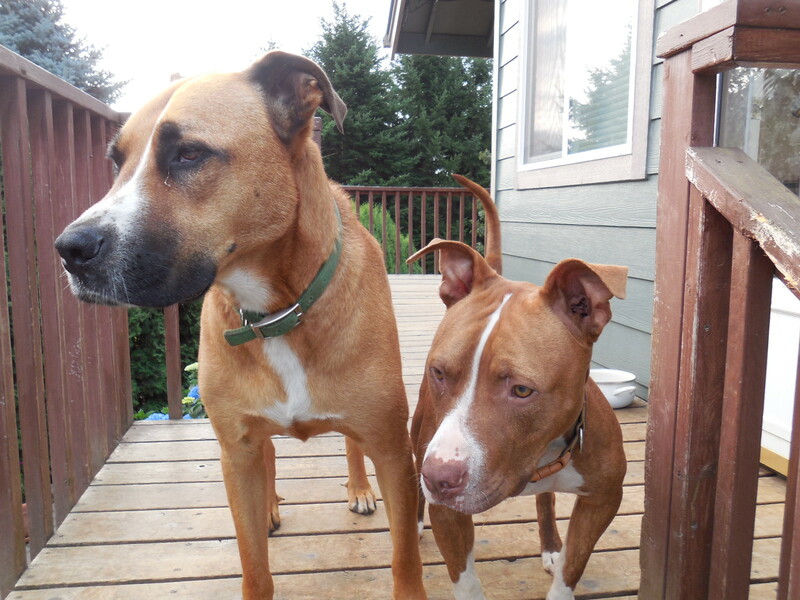 When they are on a walk, they trot side by side, almost touching at all times. They take treats nicely and walk well on leash. 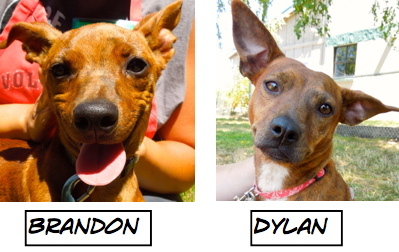 They are a tad shy, so a family with love and patience would be perfect for these two. Busy is a little chubby and would like to get her girlish figure back through walking around the neighborhood with Max. Here they are on Sunday with Sarah. 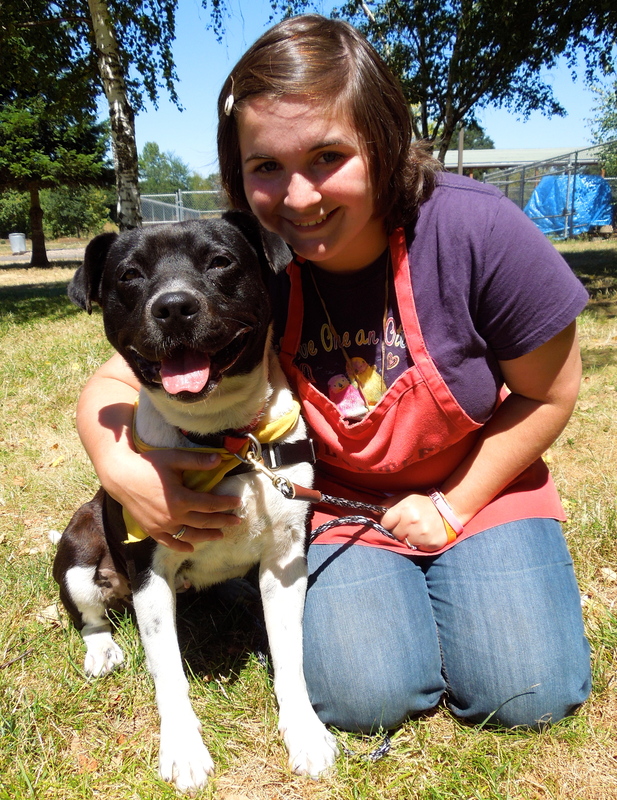 If you’re looking for a friendly, outgoing, active new family member, then look no further than Montana! 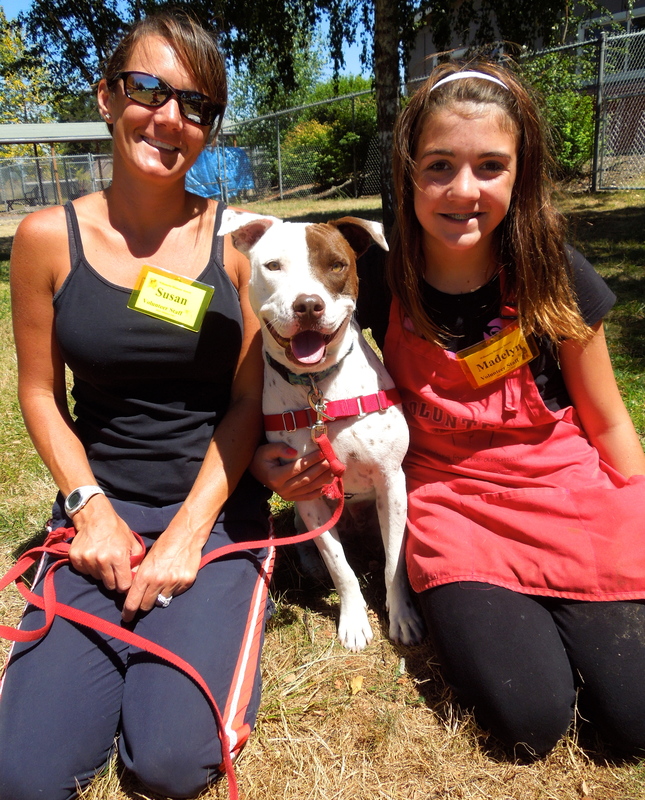 He is a one-year-old Pit Bull Terrier mix who enjoyed spending time with volunteers Susan and Madelyn on Sunday afternoon. This week he is a Camp Dog and loving the kids’ attention. Today he got a bath. He has lived with small children and done well. He’s a terrific young boy. Wishing you had a reason to go jogging, hiking, or walking? I could be your reason! 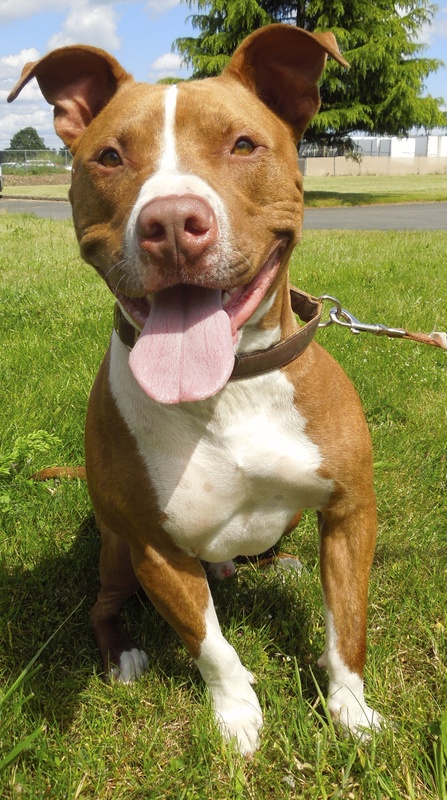 This energetic, high-energy, three-year-old Pit Bull Terrier mix is named Jersey. 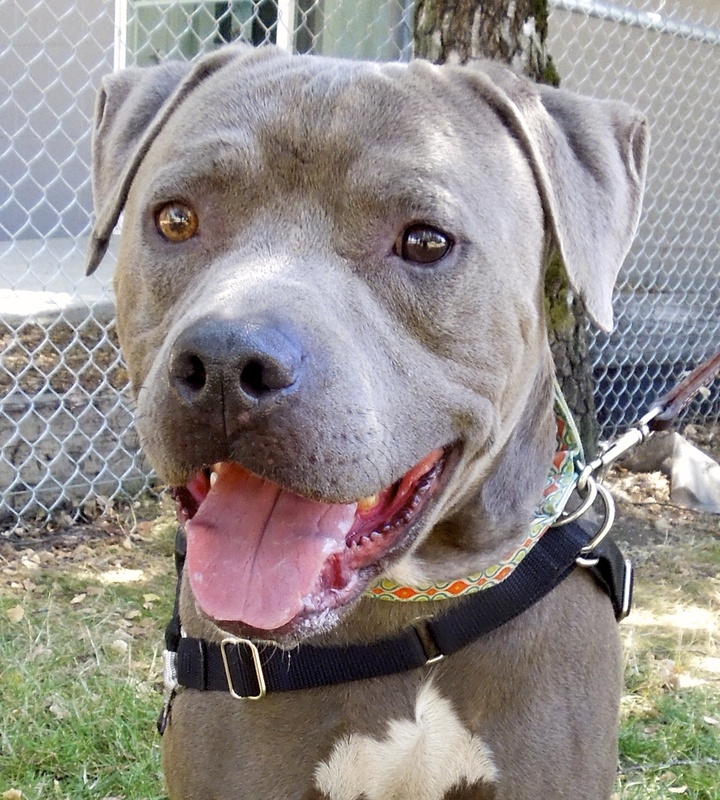 She is a happy, affectionate young girl who would love to be adopted by an active family. She walks on leash pretty well, is treat-motivated so will be fun to train, and will be a delightful new addition to a family looking for fun. Sarah fell in love with her on Sunday, as you can tell. 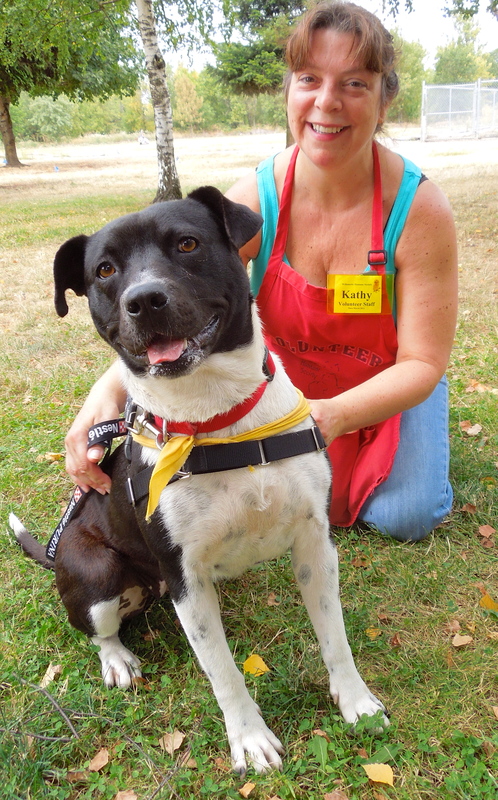 Here she was today with volunteer Kathy. My name is Sadie! I’m looking for a special family. 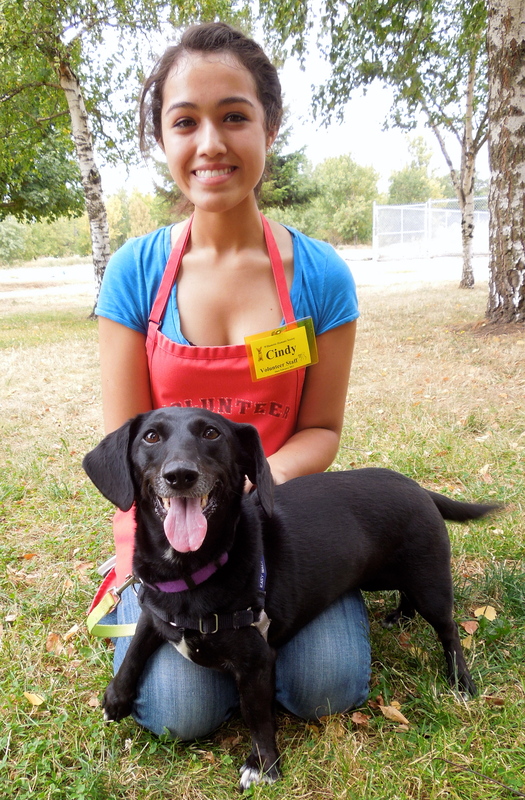 Sadie is a three-year-old Dachshund mix. She has lots of energy and loves to go on walks. She has a mind of her own and loves adventures, so will need a secure yard. She also needs a gentle, adult-only family. 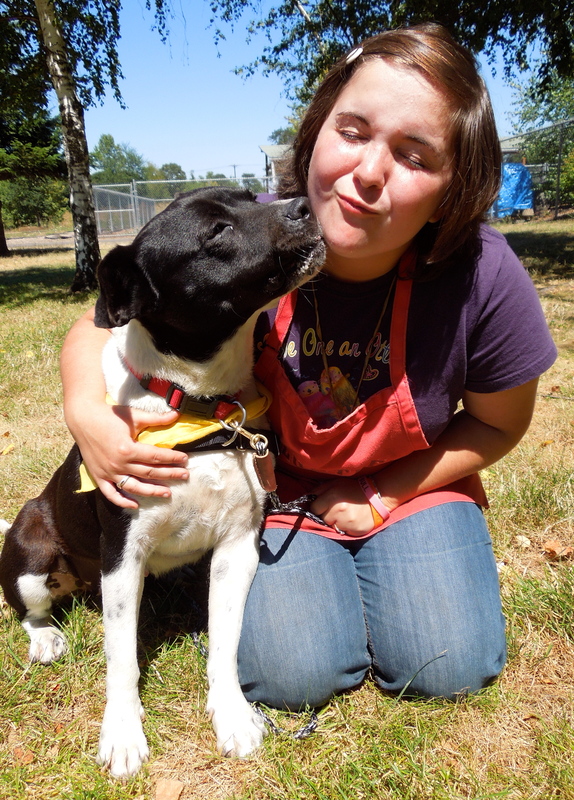 She enjoyed her time with volunteer Cindy today. 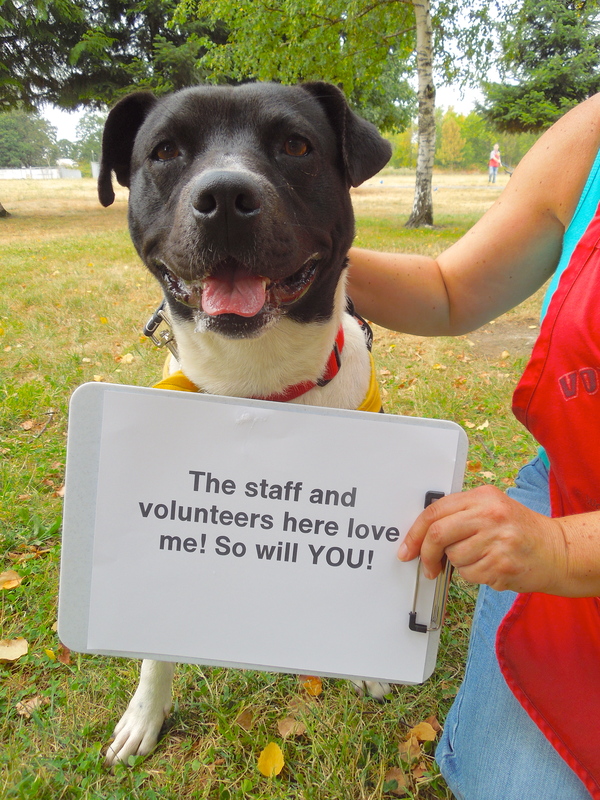 I featured Pony in last week’s post, and want to mention him again this week, as he’s still waiting for his new family. Pony is a Hound/Pointer mix and is seven years old. I said last week that he was quiet in his kennel, but found out today that is not always true, and his barking may put some adopters off. He is feeling very stressed at the shelter which is not surprising since he’s been there since June 6. 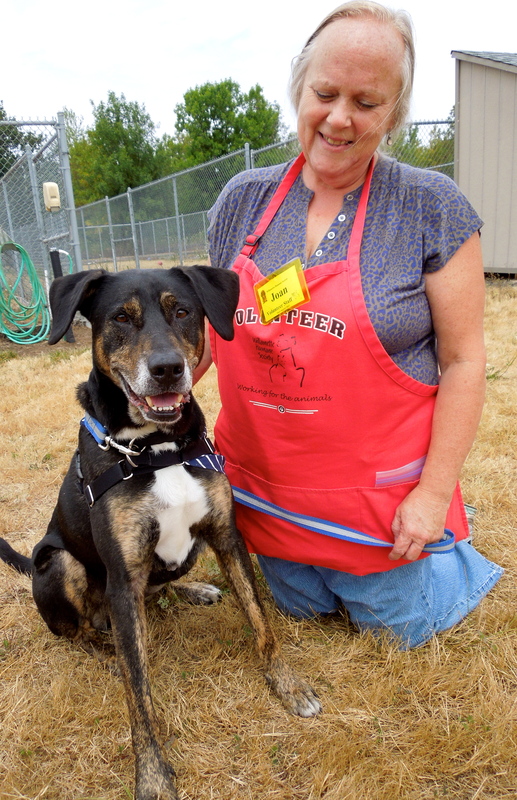 He loves being outside and today was enjoying his time with volunteer Joan until he was stung by a bee! The poor boy was understandably upset for awhile. He walks very well on leash, is treat-motivated and is past the puppy stage! I’m hoping a new family will adopt him very soon. I’m in a foster home, but I’m still available for adoption! Want to meet me? 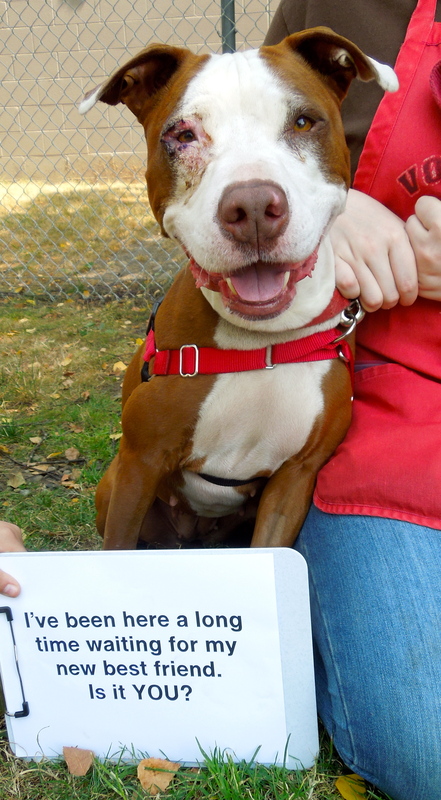 Gilbert, a two-year-old Pit Bull Terrier mix, has been through a lot. 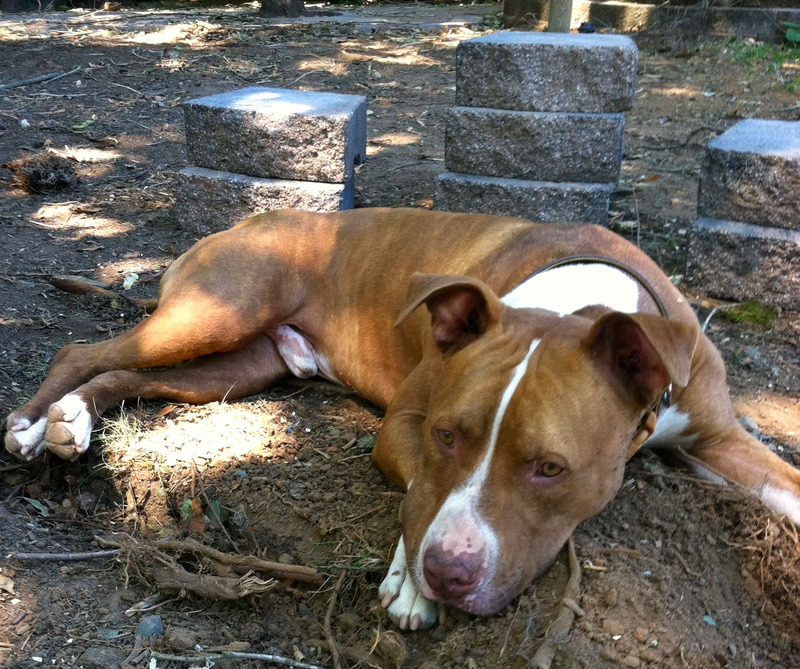 He had shoulder surgery and spent his recovery time in volunteer Jolene’s foster home. When he healed, he came back to WHS, but the shelter stresses were too much for him and Jolene took him back into foster again. He is still in need of a forever home. He is a wonderful boy looking for the right family to call his own. 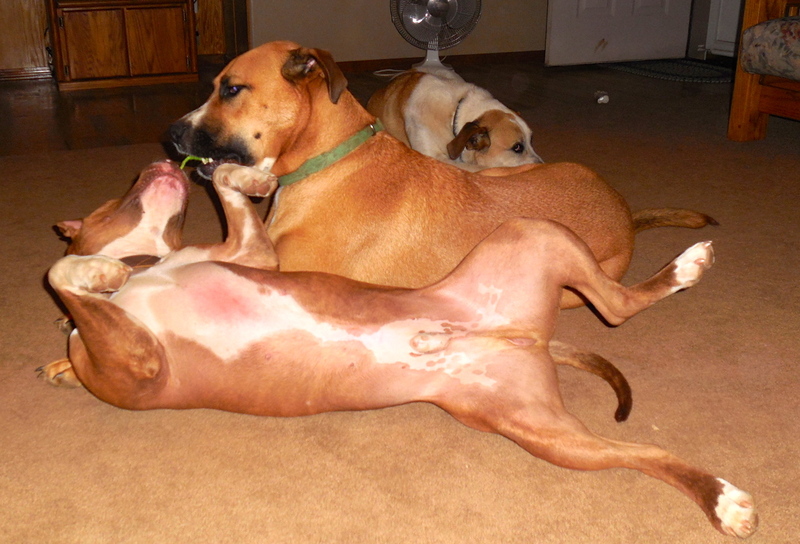 Here he is in his foster home, in his own words. “My name is Gilbert. I am quite a character. 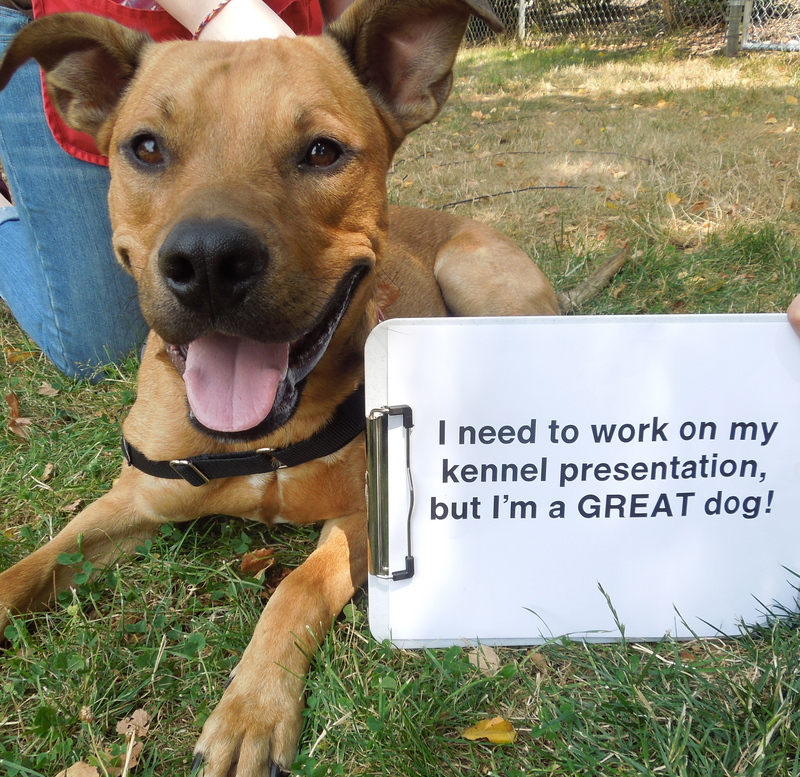 I am a 2 1/2 year old Pit Bull Terrier mix. I am old enough to be done with house training and chewing, but young enough to play, learn new tricks, and to go on adventures. I had surgery earlier this year on my shoulder, but am fully healed. I am strong, healthy, happy and very energetic. My goofy looking shoulder only reflects my personality and inner beauty. I like to play with tennis balls, ropes and rubber toys. I like rawhide chews and peanut butter-filled Kongs. 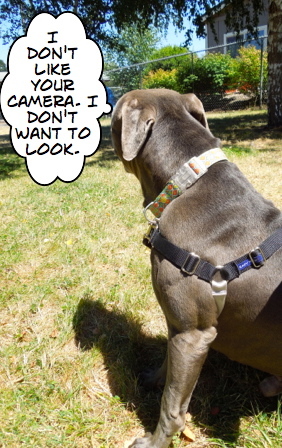 I love to go for walks and am working on my leash manners. I know the commands sit, down, come, leave it, take, and “in” for going into my kennel at bedtime or car rides. 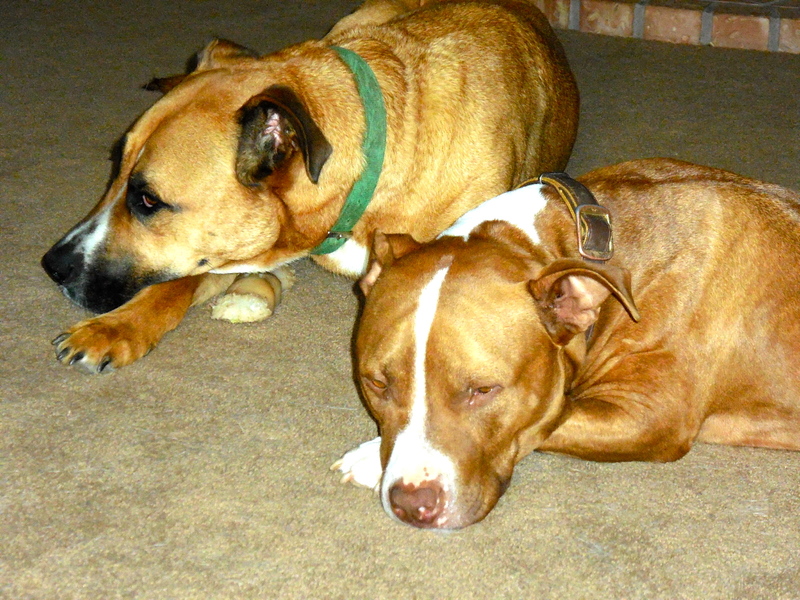 I spend my afternoons with my buddies, the other three large dogs I live with right now. We all play and take naps together. At night, we snuggle with my foster family. I love a good rubdown and a kiss before bed. I like to meet new friends but kinda get excited when dogs are too anxious with me. With a one-on-one meet and greet and some time, I should do just fine. I just got here and I’m ready for FUN! I met a new goofy dog today who will make some family a great new best friend. Here is Mack, a one-year-old Saint Bernard/Labrador mix. He is such a happy boy, you can’t help but smile. He loved my hot dog bits and, as you can see in the picture, was ready for any action that might come his way. 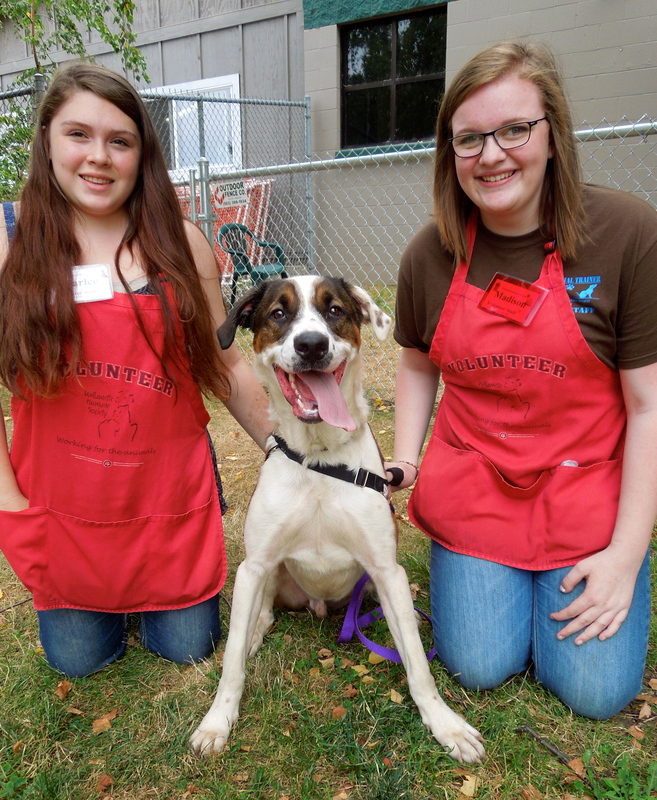 Volunteers Harlee and Madison had a great time with Mack. Of course, I had to spend some quality time with Axel, the two-year-old Boxer mix who has become a standard on my blog posts since a group of us volunteers formed Team Axel to work on his skills to make him more adoptable. Volunteer Linda brought him a new blue egg and he is absolutely bonkers over it. 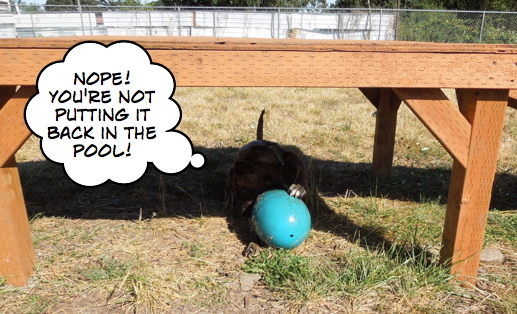 He carries it around just like he did the red one and bounces with it across the yard. 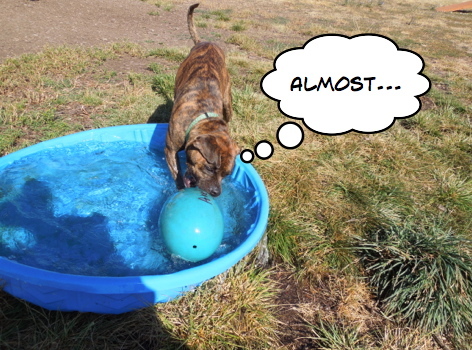 I couldn’t help myself, I put it in the pool to see what he would do. He was not amused. 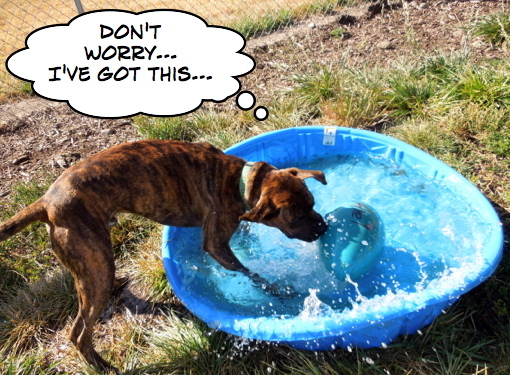 The many staff and volunteers who love Axel continue to hope his forever family will come soon. I’m going to close this post with some pictures I took today with some volunteer help just for fun. What a great nanny dog Mary is! The signs with the pleas from the dogs are great. So nice that Mary’s new family sent the update with the picture of Mary with the new family member. 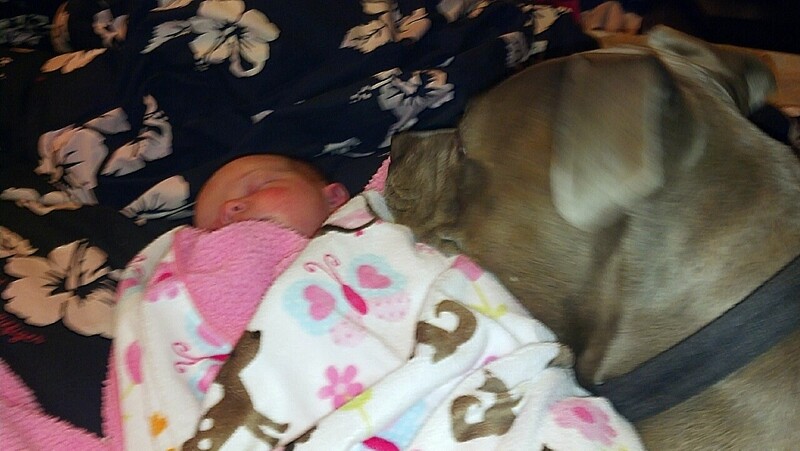 I wish more people realized that “pitbulls” can be such great family dogs. And as your photos show, have such cute smiles.